The pure aroma of fresh crop , deep golden-green color , and rich flavor of our superior Extra virgin Olive Oil begins in family’s own olive groves and serves as the exclusive choice of five-star hotels and award-winning restaurants throughout Greece , in the Unitted States , and Canada. Seferlis Estates Olive Groves proudly apply traditional cultivation methods refined through generations of commitment to excellence. We nurture our olives with care and harvest them by hand to ensure the finest flavor and highest nutritional value possible. Our crops are cold pressed using top-standard , state-of-the-art processing , bottled , and stored in our own plant. 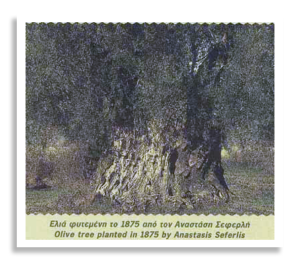 Our great-grandparents began cultivating olive trees and producing olive oil in 1875. As this tradition passed from one generation to next , we learned to love our blessed trees and understand their mystery. Our respect for more than 100 years of tradition arms us with unsurpassed expertise in olive oil production. We use only current-year crops for our oil and guarantee that our olives are of Laconian origin. Labels , expiration dates , and chemical analysis in accordance with EU and U.S. regulations for extra virgin olive oil. In addition to extra virgin olive oil , we also produce the superbly flavored Kalamon Olives packaged in our family’s traditional recipe of oil , vinegar , and brine.